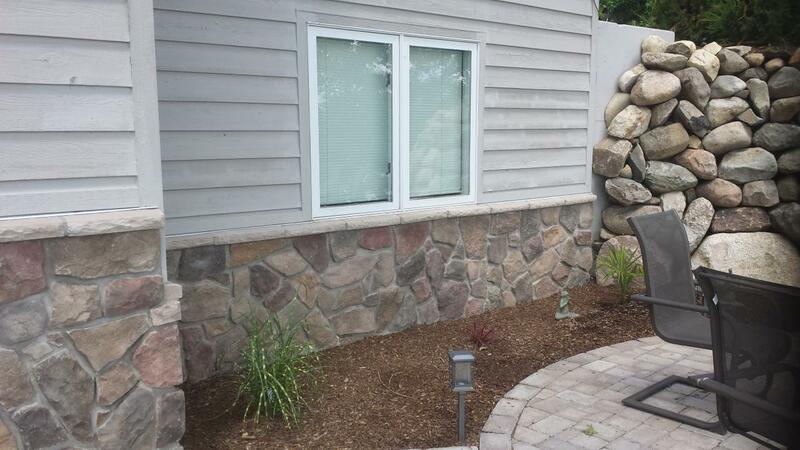 Depth and Contrast provided by the Stone. 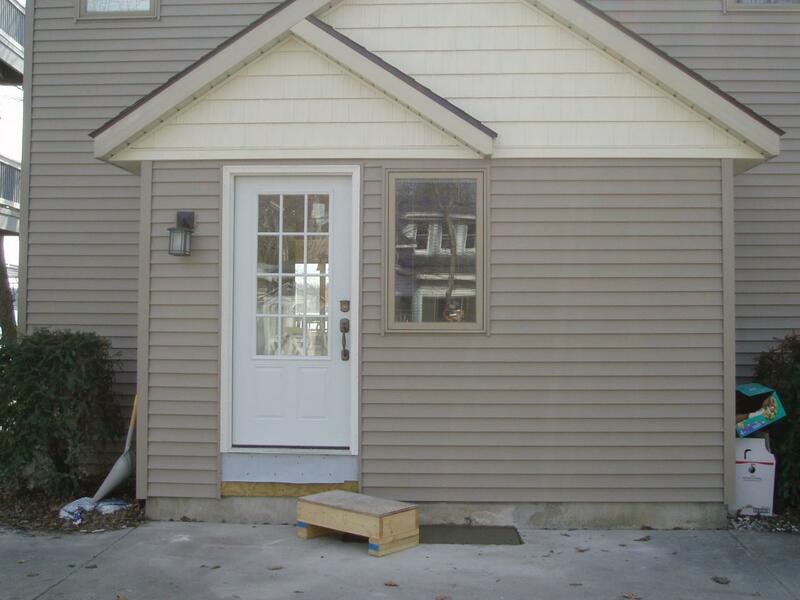 This plain entry was in need of dimension and depth. 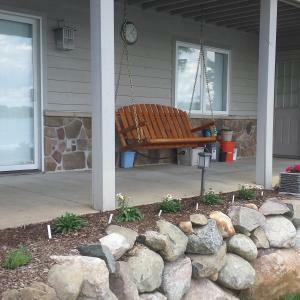 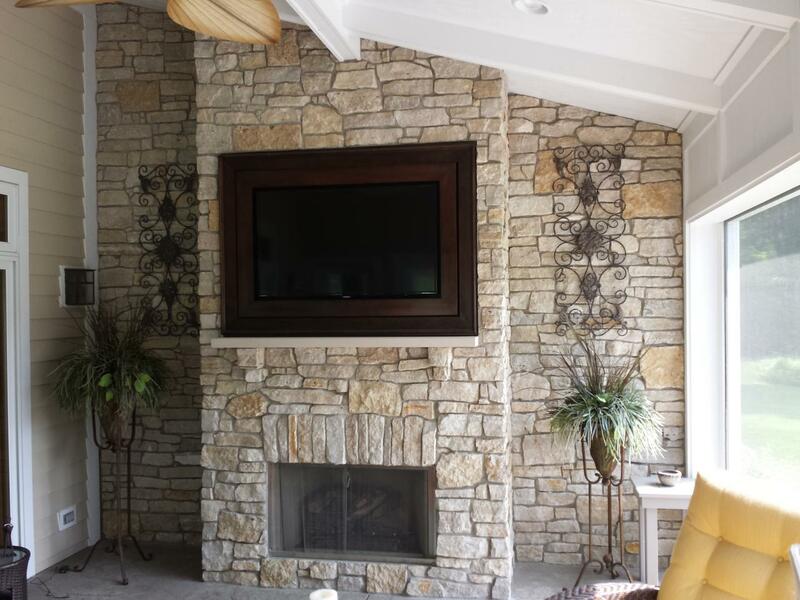 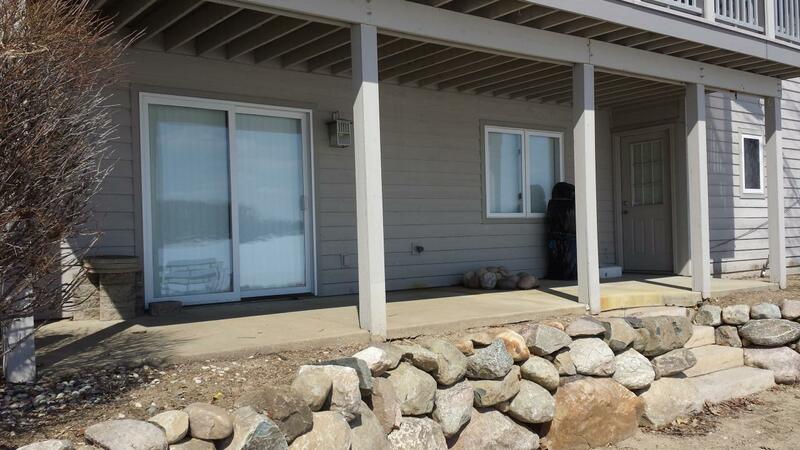 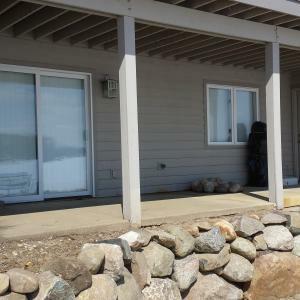 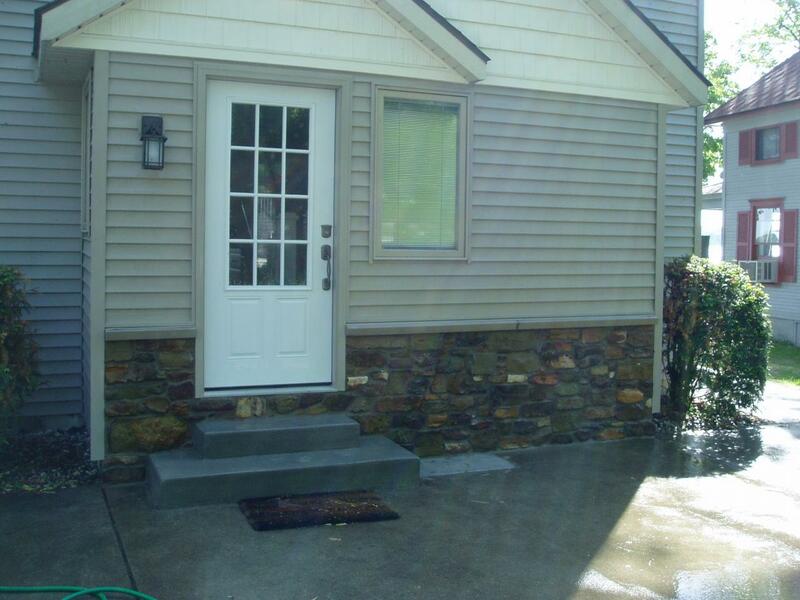 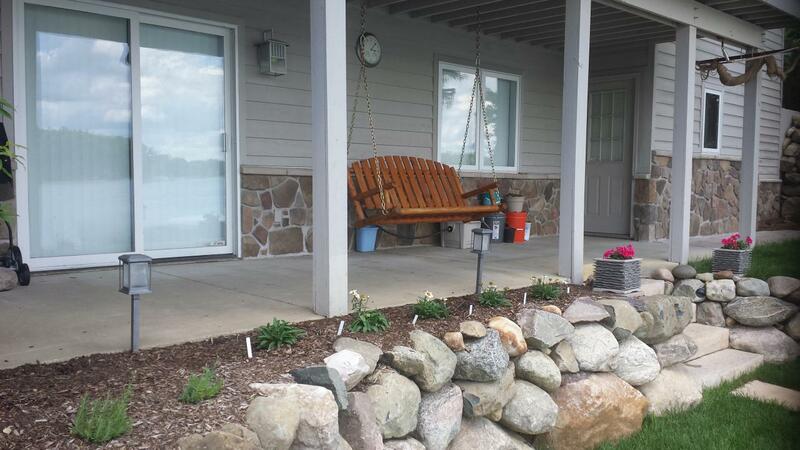 The stone Veneer and Limestone sill created the depth and dimension needed, and created a warm and desirable entry. 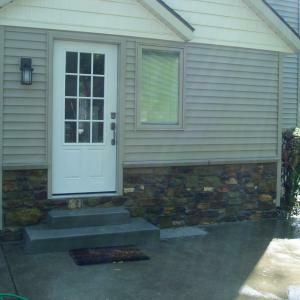 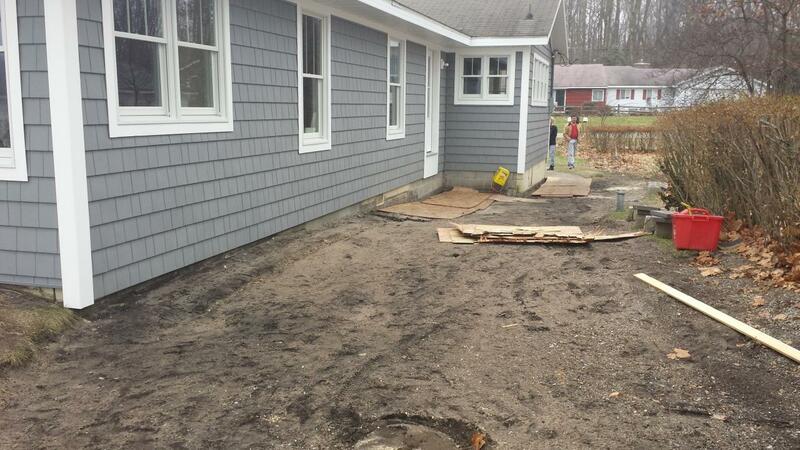 Stone Under Concrete Steps Front View. 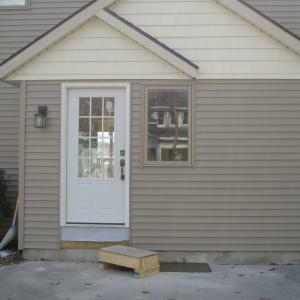 Enjoy a New Inviting entry for your home or building. 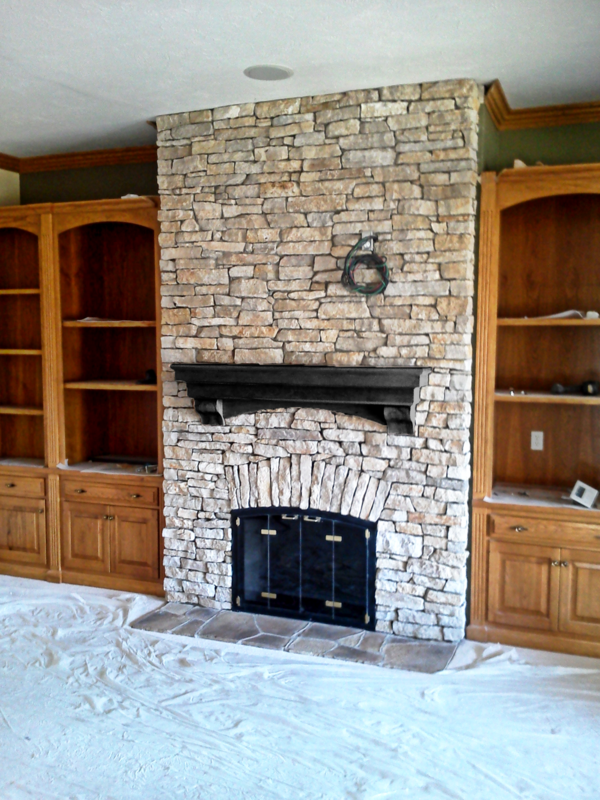 Let Us Build a Set for You. 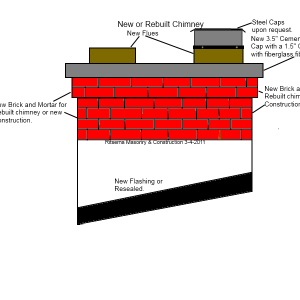 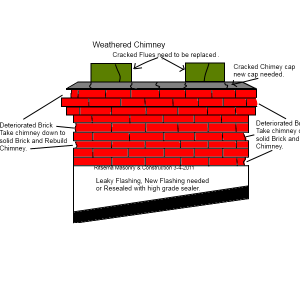 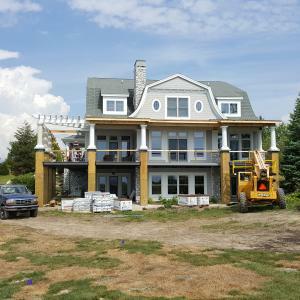 New or Rebuilt Chimney construction. 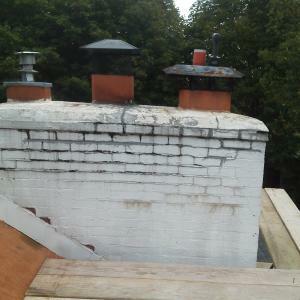 The above picture on the left depicts the view of a typical chimney that is aging and is weathered and is need of repair. 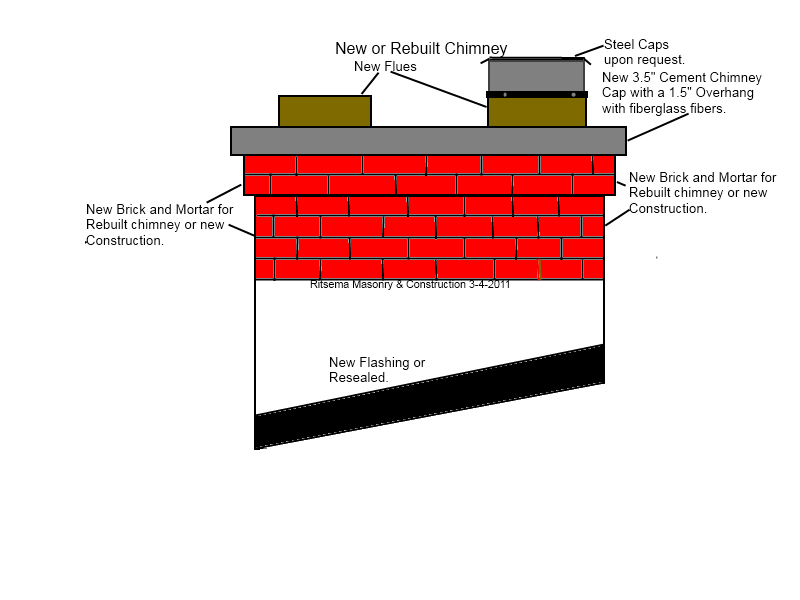 The chimney on the right is a rebuilt chimney with new materials and improved methods of construction. 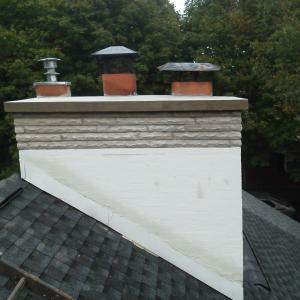 Chimney repaired and cement coating applied. 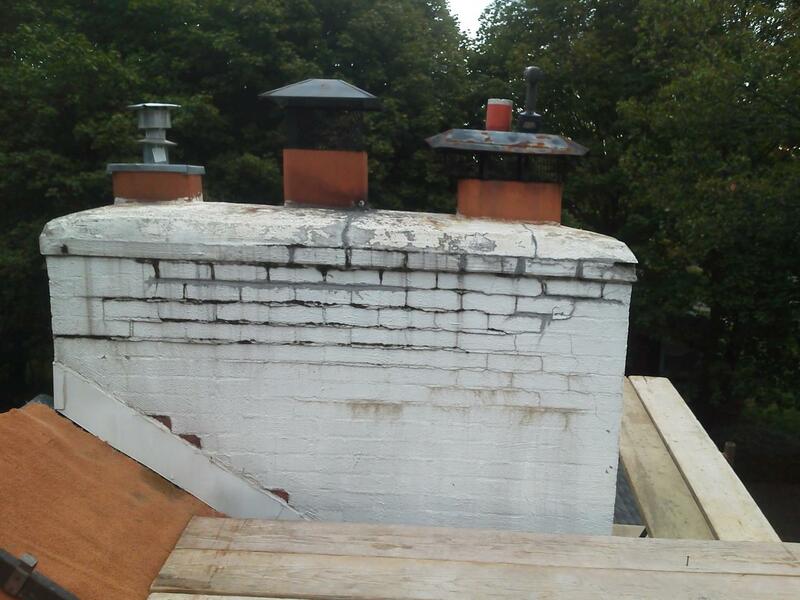 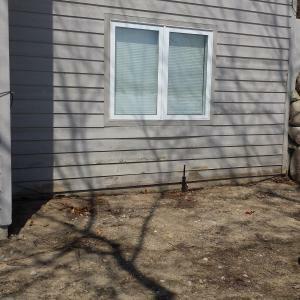 Chimney was coated with a sealer and continued to deteriorate. 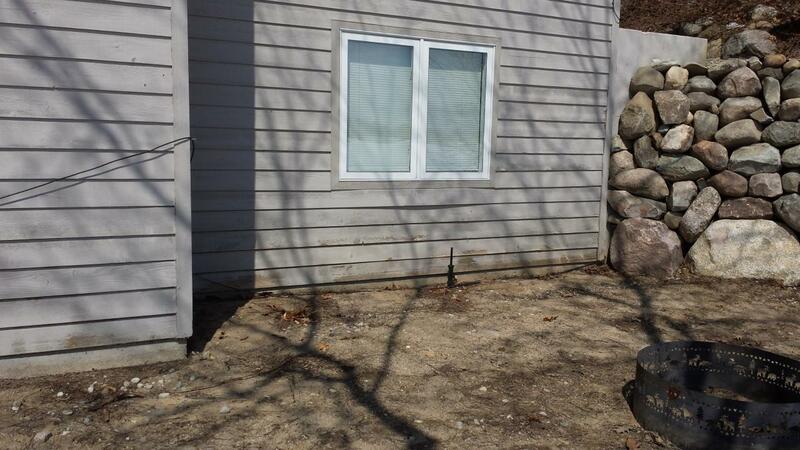 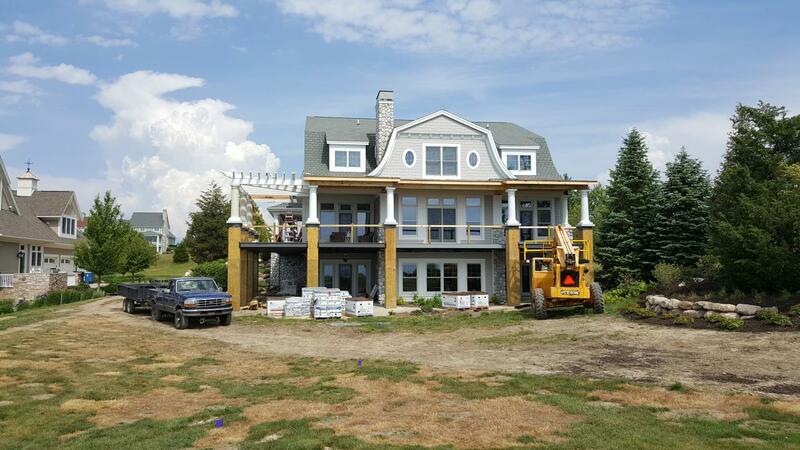 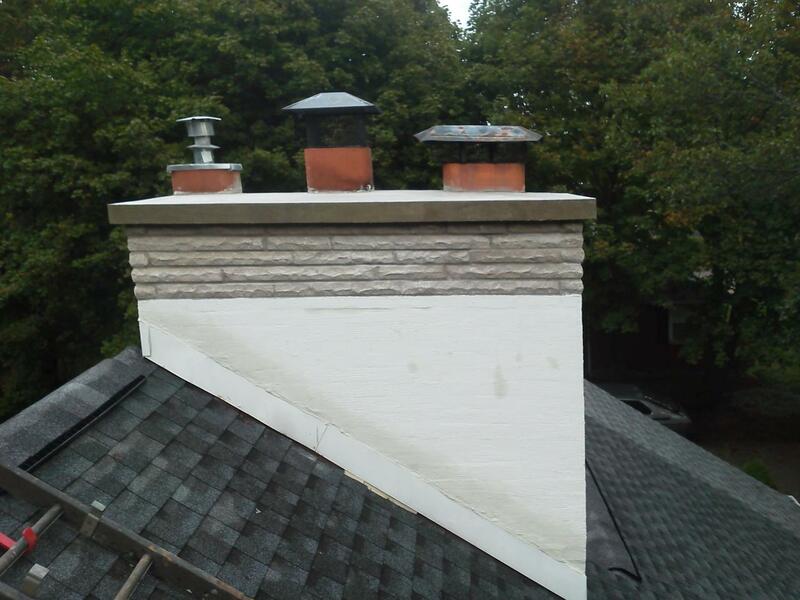 Chimney was repaired with 5 courses of 2" limestone rock faced and then recoated with waterproofing cement coating. 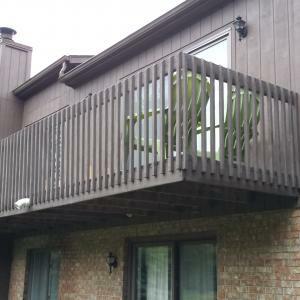 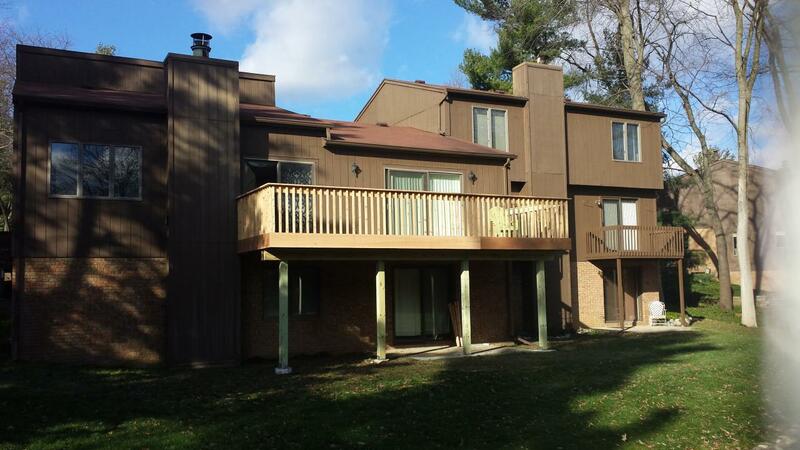 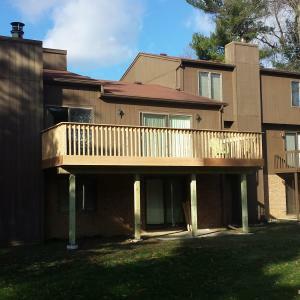 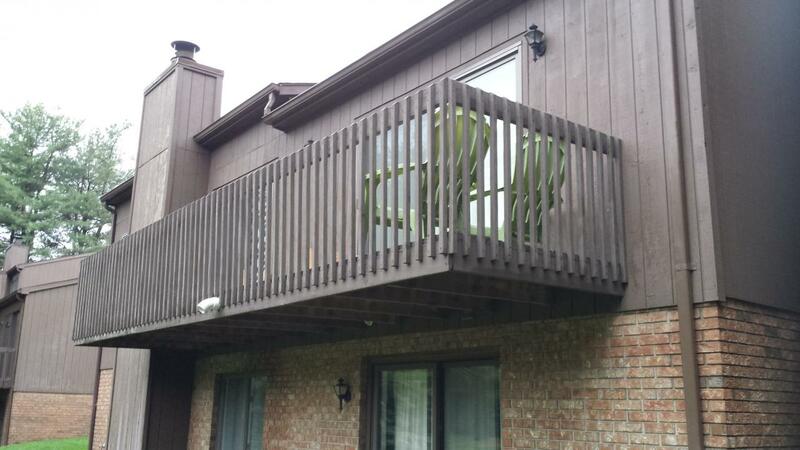 After a week a new 10' x 24' deck with custom cut Cedar spindles and a 6"﻿ Cedar rail. 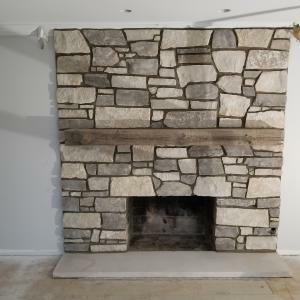 All that is needed now is a party. 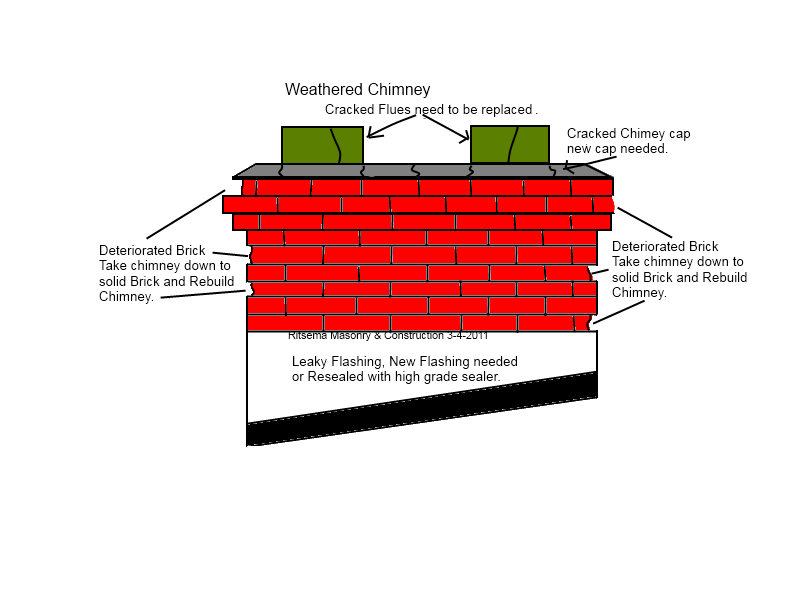 Brick were disintegrating from water penetration due to leaking cap blocks. 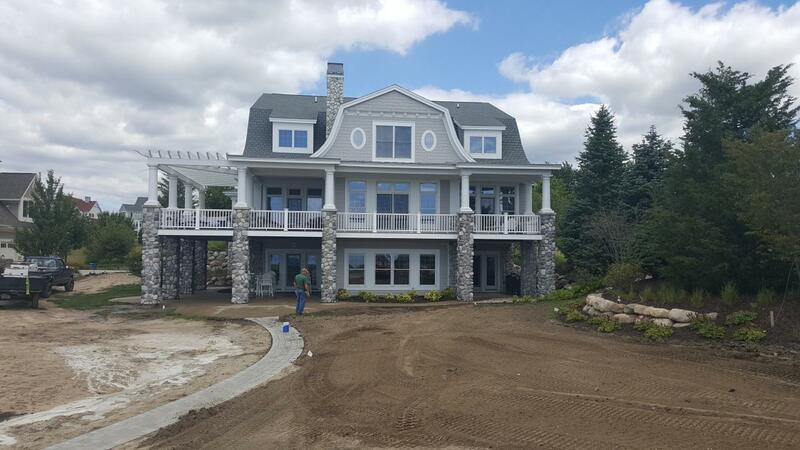 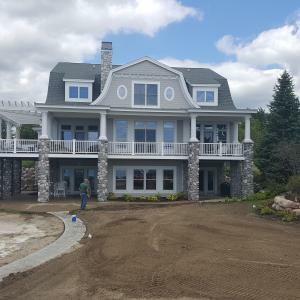 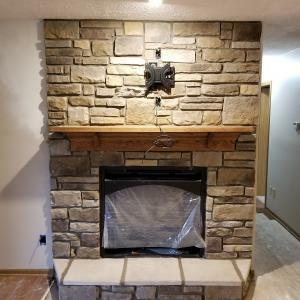 New Brick were installed and Limestone caps creating a classy look and a solid cap. 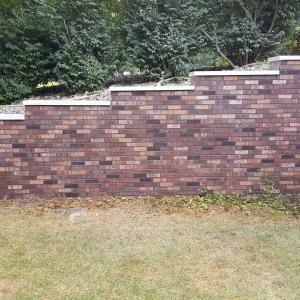 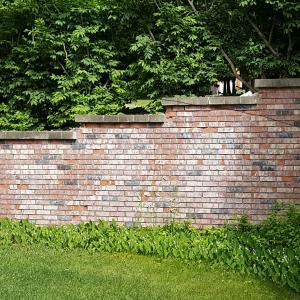 Two Retaining walls were repiared with new brick and capped with 18" Limestone a very classy look and a very good cap for Michigan weather. 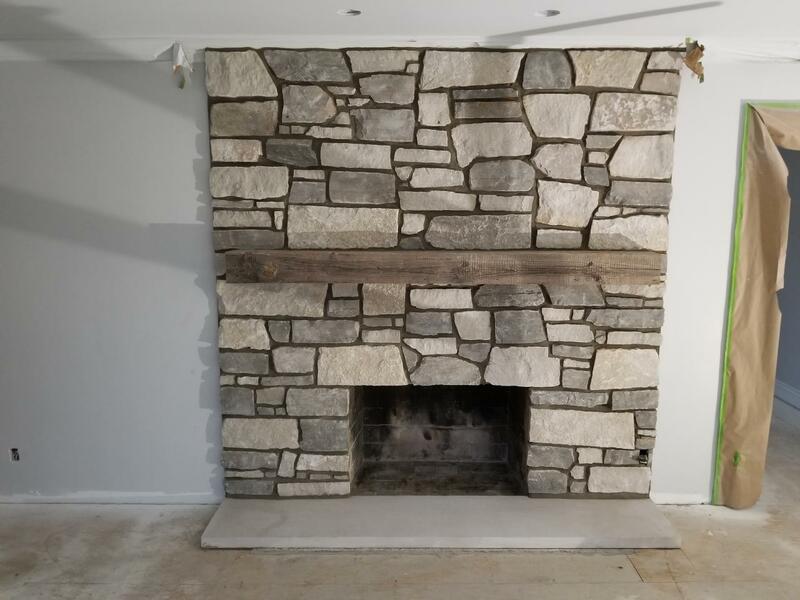 The fireplace on the Left is stacked stone, the joints are not filled with mortar. 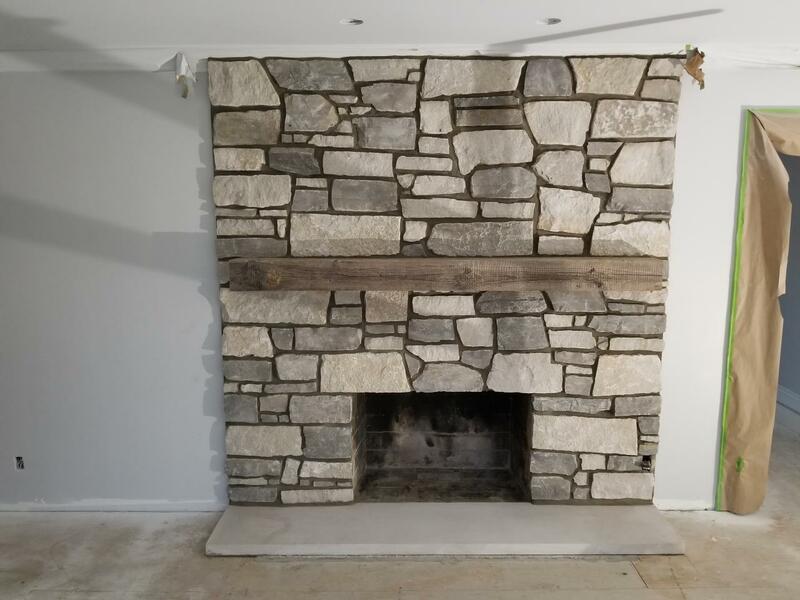 The fireplace on the Right is laid and then grouted with grey mortar. 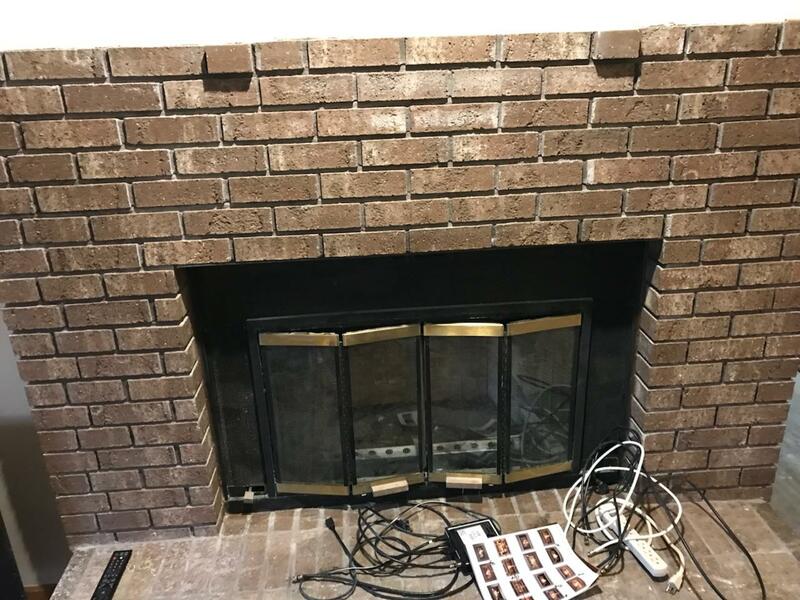 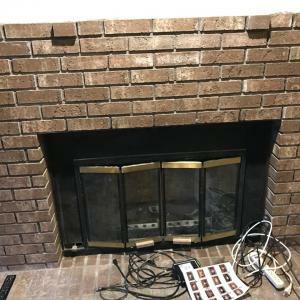 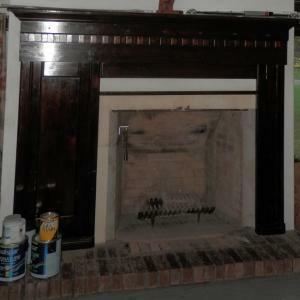 A plain Brick Fireplace Face. 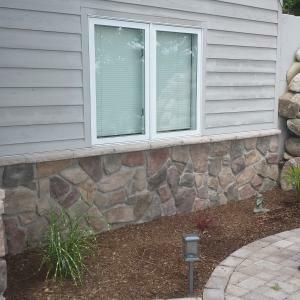 A Stone Face replacing brick. 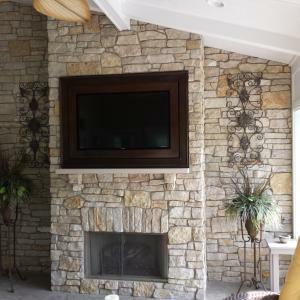 Bucks Creek Sage stone used in new face. 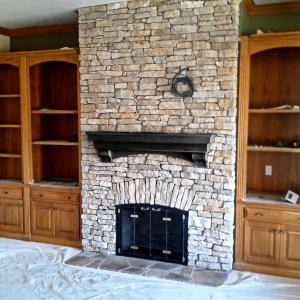 Owners wanted a new focal point in their living room. 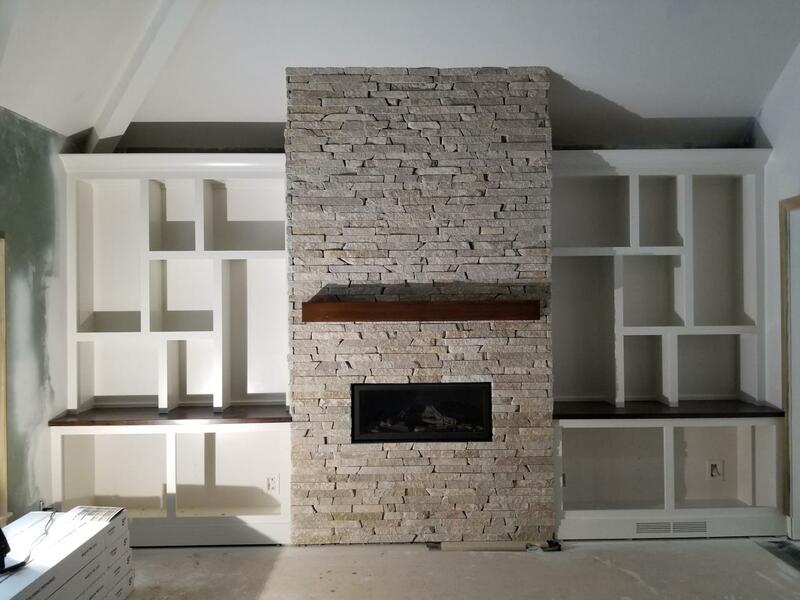 The new mantle and the new Stone created a special living area. 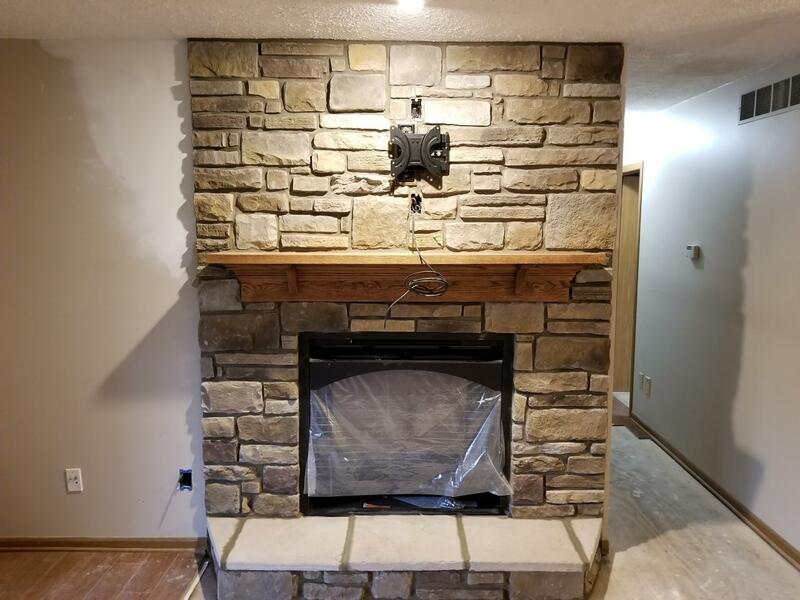 Barn Mantle from out east. 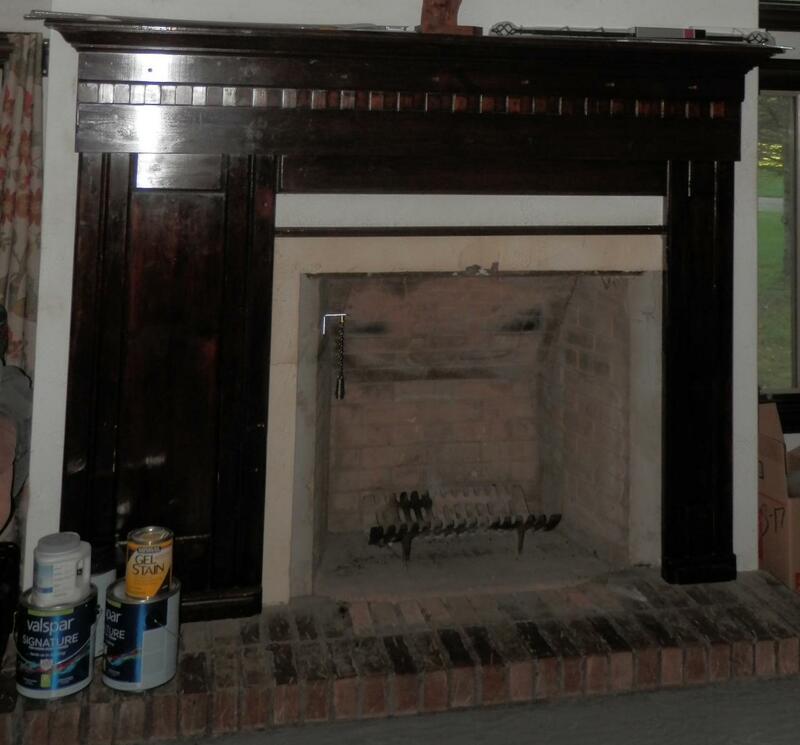 Owners updating Fireplace Face and increasing size to create new Focal point in living room creating a country look. 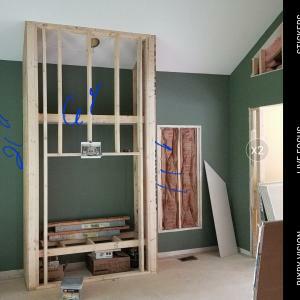 Owners were updating Living Room creating a new focal point with straight lines. New Stone installed on Face. 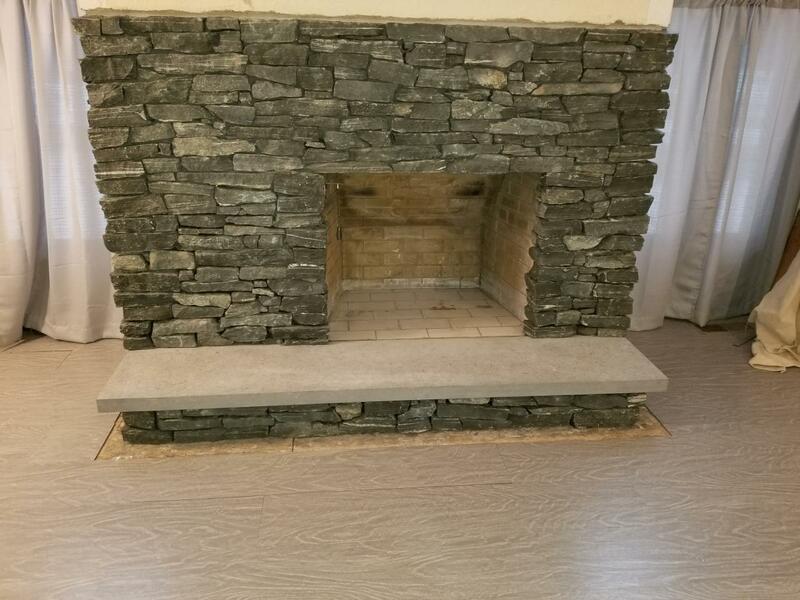 Firebox floor was raised 4"
Hearth stone Royal Beluga with Sandblast Finish. 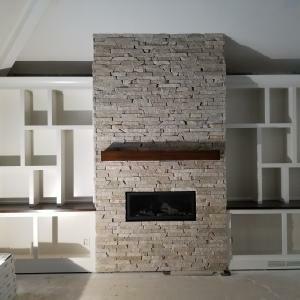 Real Stone creating a new depth to and existing Fireplace. 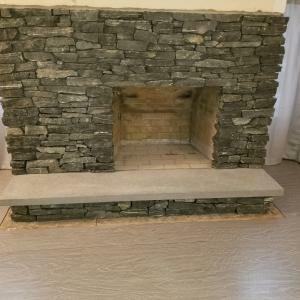 Raised Hearth a nice place to sit and enjoy a Fire. 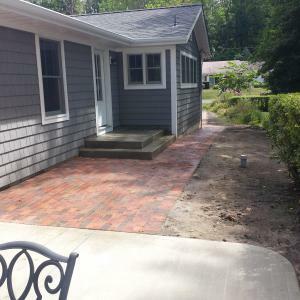 A Circular Brick Paver footstep over Concrete a nice place to relax and rest. 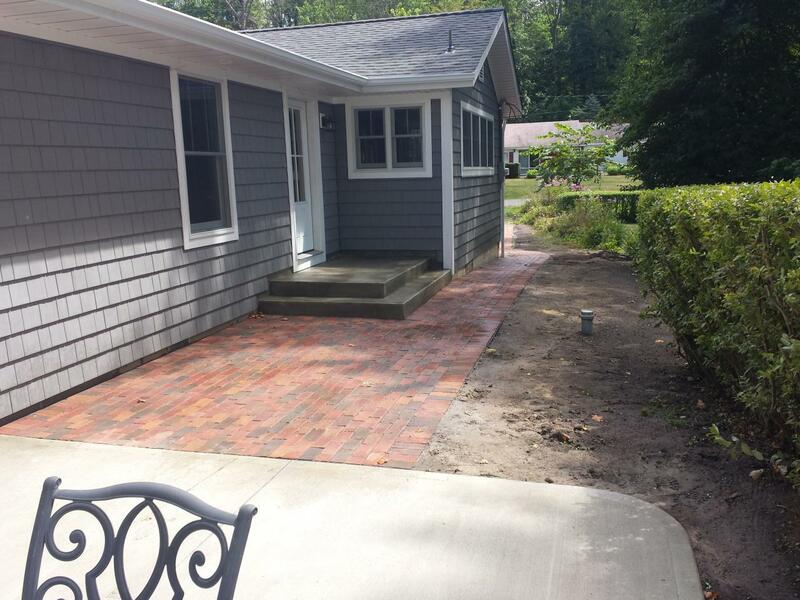 Brick walk leading to stoop. 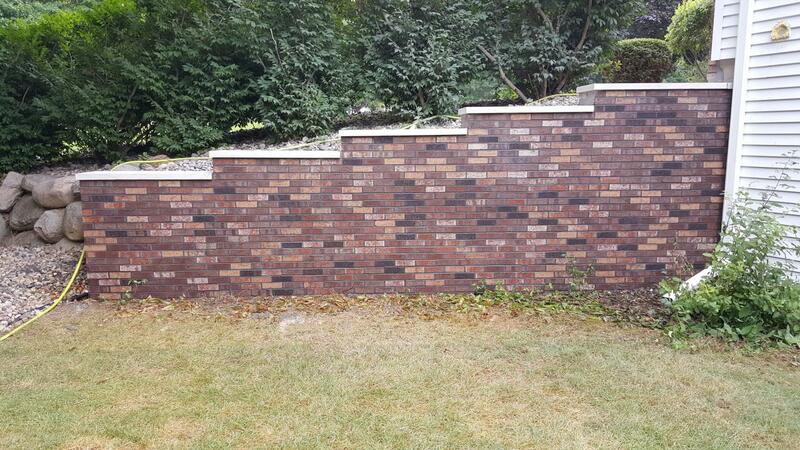 Copyright Ritsema Masonry & Construction 2016. 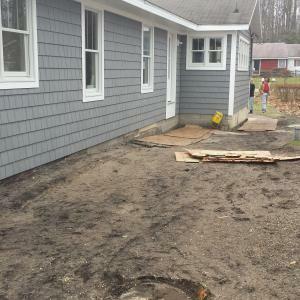 * Last Updated 3/26/2019 All rights reserved.